• and other minor improvements and bug fixes. I want to say thank you for everyone! Your bug reports greatly helps to fix error much faster, although, frankly, not always the reports help to understand everything about the issue... Sometimes it is just necessary to know how to reproduce this or that bug, so please, do not be angry if I suddenly interrogate with a passion for the topic "how did you do it?" Have a nice day and creative mood! • improved highlighting the current block in the script. There is also good news for owners of old Macs who do not want to update the operating system to the latest version - now together with the main version for Mac OS X we will release a version based on old libraries with the code name granny It will work on Mac OS X, starting with version OS X Lion 10.07. The only thing that in this version there will be some known problems, for example now, shortcuts didn't work properly for changing paragraph style in some cases. Otherwise, the granny version should work without significant differences from the main version for Mac OS X.
P.S. Now updates do not come out as often as we would like ... But it's not that we abandoned the project, in fact, we are hiding! Now we are very interested in the development of mobile versions for both Android and iOS and I think that within a month or two we will publish mobile applications. Mobile applications will be paid. At the start, a price will be equal to 99 Rubles. At the beginning, they will include the ability to edit script text, import and export from/to any sources (Dropbox, iCloud, Google Drive, etc.). You can work in the application with projects located both on your device and with cloud projects in our service (of course, with the possibility of collaborative editing). And after we release mobile applications, we switch to the desktop version, so much has accumulated, that our hands are scratching to take it! A lot of time has passed since we started working on a mobile version, but it's time to share the first results of this work. Happy to introduce you to the Android version! • export scripts to pdf, fdx, fountain docx and kitsp formats in any of the installed applications. The first version is not yet complete. In the next month or two, there will be a few updates that will add, at a minimum, a built-in help and an opportunity to edit title page. Like I said before, the mobile version will be paid. Starting with 99 rubles. You can download the app via https://play.google.com/store/apps/d....kit.scenarist or you can search the Play Market on our application name. Well, as usual, guys, if you see any problems, glitches, bugs, or suggestions, I'm ready to discuss everything and make the app even better. P.S. Version for iOS in work and we really want to release it as soon as possible. So don't worry, folks, it's near to be done. We have a lot of news today! First, the event of the day - the version for iOS has already been approved to the AppStore and it is available for download! It turned out that Apple has recently switched to accelerated application reviewing and now it lasts not 2 weeks, but 1-2 days! So guys, who were waiting for this moment - he came! I'm very happy and congratulate all of us on the release of the KIT Scenarist version for iOS!!! Next is not very good news - we have got a mistake with the cost of the application, it turned out that in the AppStore we can not set the price yourself, and we can only use default price grids, as a result, the first version for iOS will cost not 99, but 149 rubles, I apologize for my ignorance in this matter, in the future I will be more attentive. The next news about the Android version. Today, we published an update that fixes program crashes when importing scripts from Dropbox in some cases. Well, the latest news is dedicated to pirates and those who decide to use their services. We got information that the apk-files of the Android-version appear on the network. We were ready for this, so we decided to present you a gift - a version of the program which wasn't installed from the Google Play Market, will continue to work. Except for one small nuance - sometimes the program will delete a random script from the phone. Be ready, pirate life is full of dangers ! So, this is the link to download iOS version from AppStore. Have a good day, my friends! 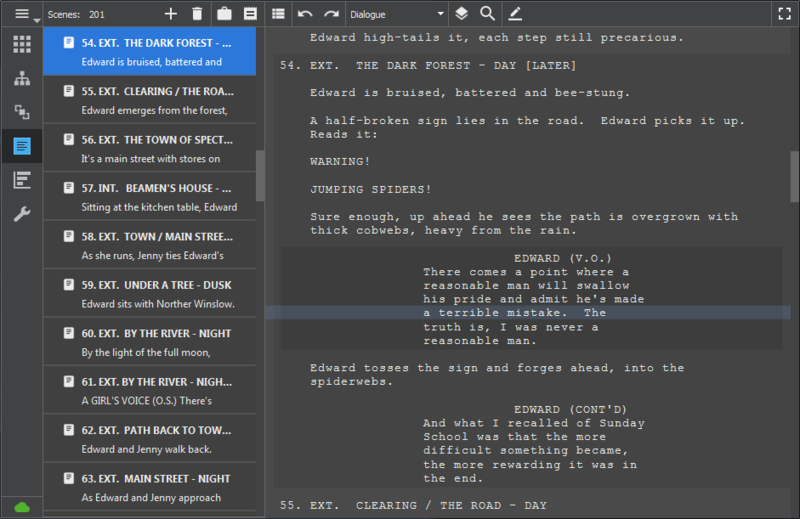 We have an update - meet the version of KIT Scenarist 0.7.1 rc 6! • have been added translations to Farsi and Chinese. Also, we signed Mac OS X version, so, now it should allow using application without any restrictions. I wish everyone a nice day and a sunny mood! The next update has already been published! • the dialogs for adding cards, scenes and design elements have been slightly improved. It seems that version 0.7.1 will soon be rightfully called stable! Meanwhile, we are moving on to work on the next version of KIT Scenarist 0.7.2. In it, many improvements and useful tools will come to us. As I prepare, I will publish small reviews of various innovations. In addition, we are waiting for a couple of updates to the mobile version, which will add the ability to copy/paste/search for text, the ability to edit the title page and help. And then more and more updates I feel, in the future, a mobile version will need a separate site or, at least section on the site. Well, for now ... download the update and go to tell your incredible stories! Today we have a small update. It includes fix for crash on projects opening and improved cloud service working (fixed one bug and improved cards sync). I wanted to say thank you to everyone who supports us today! Your bug reports, criticism, and suggestions make the program better together with us! Thank you very much for this, friends! Good morning, guys. And we have another small update of KIT Scenarist 0.7.1 rc9. It fixed some problems with cards and improved the synchronization of cards stamps in the cloud service. I wish you productive day!